Obituary for Landis Klinger JR as published in The Philadelphia Inquirer on 06/07/1970. 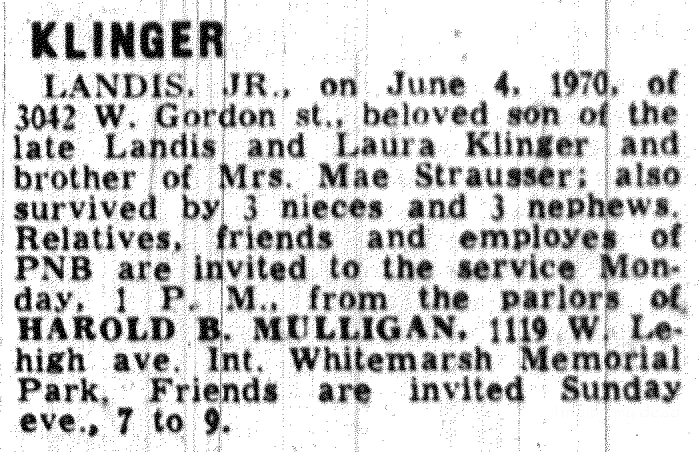 LANDIS, JR., on June 4, 1970, of 3042 W. Gordon St., beloved son of the late Landis and Laura Klinger and brother of Mrs. Mae Strausser; also survived by 3 nieces and 3 nephews. RElatives, friends and employes of PNB are invited to the service Monday, 1 P.M., from the parlors of Harold B. Mulligan, 1119 W. Lehigh ave. Int. Whitemarsh Memorial Park, Friends are invited Sunday eve., 7 to 9. 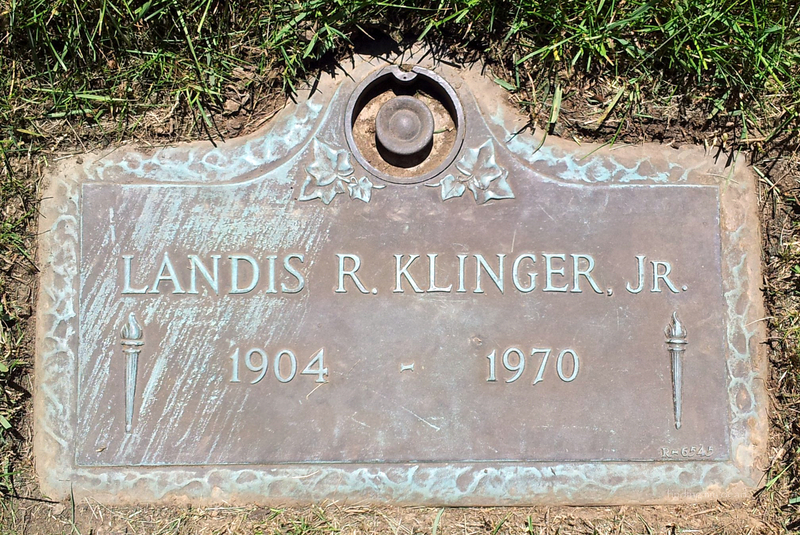 Landis was born on April 18, 1904 to Landis and Laura (Wetzel) Klinger. Born in Philadelphia, he lived in the same house in the Strawberry Mansion section of the city throughout his entire life. Landis’ father died in 1941, his mother in 1965 and his younger brother Ralph died in 1962. Mae (Wetzel) Strausser was Landis’ step sister, they had different fathers. Landis never married or had children and he was a banker for at least forty years. I wish I could include his photograph in this post but I have not yet found one as he seemed to always be the person taking the pictures. Whitemarsh Memorial Park, Ambler, PA.